"A Top Hollywood Screenwriter Opens Up." The Columbia Review. Bill Goldman Tells It Like It Is. This book is written with a warm, personal and conversational style that makes you forgot you are reading. It offers the priceless opportunity to spend many hours one-on-one with a great writer, whose list of screen and literary credits is long and without match. Dolores Claiborne (1995; consultant), The Chamber (1996) – based on the novel by John Grisham, Extreme Measures (1996; consultant), The Ghost and the Darkness (1996), Good Will Hunting (1997; consultant), Absolute Power (1997), The General’s Daughter (1999), Hearts in Atlantis (2001), Dreamcatcher (2003), Wild Card (2014) – based on his novel. 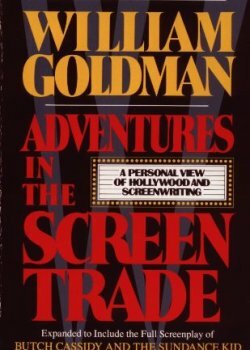 In this book, Goldman tells us how his life and craft took him on a lifelong adventure in the creative world of novels and films (and much more!). And he tells it like it is (or was) with grande modesty, cutting humor, and cynical yet heartfelt sincerity — and without reservations. I would recommend this book not only to those who love novels and movies, but also to anyone interested in biographies of people who accomplished incredible achievements in their chosen trade while overcoming modest beginnings, economic hardships, personal weaknesses, vicious naysayers, and outright impassable barriers on the path to an unlikely yet breathtaking success. This is a wonderful book about an incredible life in the real world of make belief. Highly recommended!